That means that when the front line moves, kitchen equipment moves too, including great big refrigerators that typically measure 20 feet long, 8 feet high and 8 feet wide. That’s a logistical headache. What the Army really needs is a foldable fridge, something maybe one-third the size of the typical container than can be easily opened up to become a full-sized cooling unit. Fortunately, the Army’s Natick Soldier Research, Development and Engineering Center’s Combat Feeding Directorate says it has prototyped just such a thing. Williams’s team recently announced the successful prototyping of a collapsible system that’s not only smaller and easier to transport but also more fuel-efficient. The collapsible fridge can run on 75 percent less fuel thanks to a smaller motor and high-efficiency insulation. Developing a folding fridge was “easier said than done,” Williams said. First, the team had to sort out a method for creating airtight seams. “When it expands, you need to seal the walls in a way that doesn’t allow a lot of heat in, so that the system can perform as required,” he said. Most of these issues got resolved through the use of composite materials that incorporate vacuum-insulated panels. They’re light and thin, compared to standard foam insultation, so they can be handled easily while still delivering high performance. Layered on top is a proprietary thermal management coating, a technology that helps deflect heat off the surface of the unit, reducing absorbed radiation by up to six times. “These containers are kept outside, they get a lot of sunlight, so reducing the infrared can make a big difference to their performance,” Williams said. He expects it will take three more years of development and testing to produce a field-ready product. 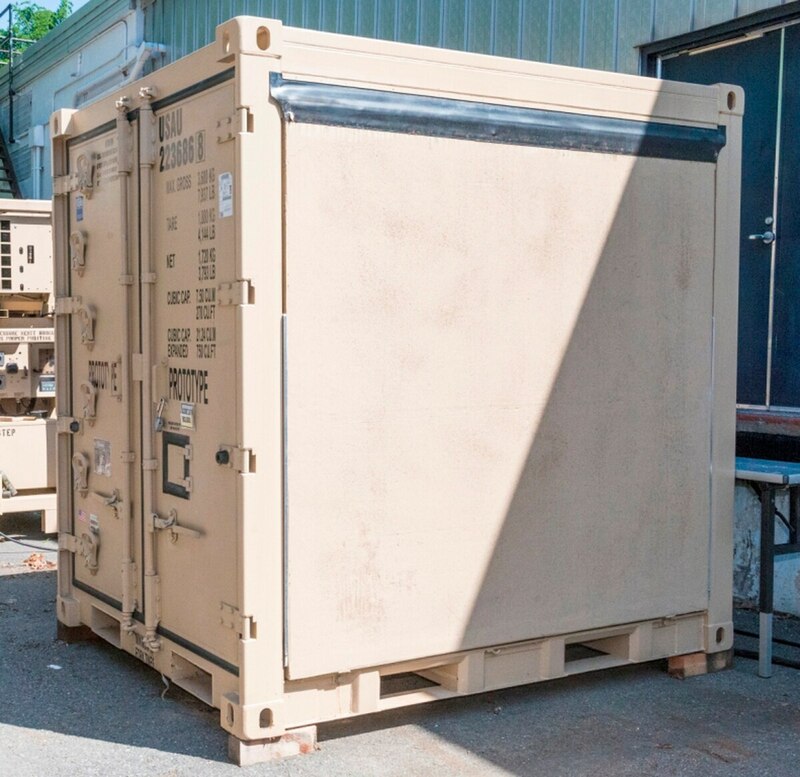 When it’s done, though, the collapsible fridge could go a long way toward easing a longstanding logistical burden facing all the armed services. In other logistics news, the Office of Naval Research announced recently that it had carried out a successful helicopter flight demonstration in its Autonomous Aerial Cargo/Utility System (AACUS) program. A partnership between ONR and technology company Aurora Flight Sciences, AACUS uses sensors and software to improve logistics by helping manned or unmanned helicopters to detect and avoid obstacles such as telephone wires; to fly in bad weather; and even to carry out logistics missions autonomously. Planners say an operator with minimal training can use the system to easily call up supplies. During the recent UH-1 “Huey” demonstration, a Marine with no prior experience trained for just 15 minutes before successfully putting the system through its paces, delivering supplies and even autonomously selecting an alternative landing site based on last-minute no-fly-zone information.